Amatka is the story of Vanja. Marketing researcher for a personal hygiene company, she is asked by her firm to make a cross-continental trip to the industrial city of Amatka to discover brands the shops stock, gaps in the local market, and what the most popular products are among its people. Amatka a communal society, after filling out the appropriate forms Vanja is provided a room and given free rein to wander the city. Meeting her roommates, the librarian, and a rebellious older woman named Ula, Vanja slowly becomes aware of skeletons in Amatka’s closet, and begins to ask questions about the rote and routine of society. Why do the people need to read and repeat the names of solid objects, like a pen or suitcase, for them to retain their shape? Why does the commune enforce societal parenting? And why does the recorded history of the poet Erren not quite fit reality? Needing to take some bold steps to get answers to these questions, Vanja’s life finds a new road by the end of Amatka. For those looking to find more of what they read in Jagganath—even in the abstract sense, Amatka disappoints. Lacking the sophisticated underlayer that gave most of the stories in Jagganath their purpose, unpredictability, and enjoyment, Amatka is a very straight-forward story that follows the plot of Nineteen Eighty-four almost to a T. Tidbeck does try to add an element of fantastical science fiction to spice things up, but it’s such a goofy idea that the gritty events of Vanja’s stay in Amatka are rendered comical by it. To give more details would spoil matters, but suffice to say the cheesier side of Clifford Simak and other golden age sf writers is well represented in material that comprises most things in Amatka. At first I was trying to take Vanja’s story seriously, but as this material gained prominence, even dominance upon the conclusion, I was left wondering what’s the point: serious examination of social issues or vehicle for cheap sf ideas? Another very noticeable issue with Amatka is style. I’ve read other reviews describing Tidbeck’s writing as something like ‘beautiful minimalism’. Minimalist it certainly is, but in the literal sense, not the figurative. Where writers like William Gibson or Jon Courtenay Grimwood can say more by saying less, Tidbeck writes in black and white. ‘Vanja picked up the piece of paper with her right hand and read it. The she put it down and went to the next room. Nina was there….’ That is not a direct quote, but it gives you an idea of how almost the entirety of Amatka’s prose reads. As evidenced by the lack of character nuance, there is almost nothing about the writing that evokes mood, atmosphere, personality, soul—something beyond the bare surface. Rarely if ever expressing something prosaically or indirectly, the novel is written in a simple, straight-forward lexicon—which is the final nail in the coffin of my belief that publishers agreed to publish Amatka in English in an attempt to take advantage of the popularity of dystopias on the market and Tidbeck’s success with Jagganath rather than its literary qualities. In the end, Amatka is a very confused novel. It doesn’t know whether it wants to be an Orwellian damnation of oppressive government, pulp 40s science fiction (technology gone wild! ), exposition on the meaning and power of language (via sentient goo!! ), or character study of a woman whose fundamental understanding of herself is turned upside down by an alternate perspective on society. This is not to say these elements cannot be merged into a good novel, rather that Tidbeck has not done so. Combined with the highly lackluster prose and simplistic assumption of reader intelligence, it all makes for disappointing reading. 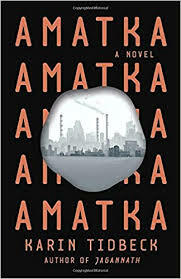 Given the high quality of Tidbeck’s short fiction, I have to assume Amatka was her first ‘serious’ writing effort—the growing pains that every writer must go through. Therefore, if you have not read Tidbeck, do yourself a favor and try Jagganath first. She is worth the reader’s investment, just perhaps not Amatka.